Rejoice, city dwellers. An architect has finally figured out how to fit your next home into a parking space. Helsinki-based Marco Casagrande, of Casagrande Laboratory, has invented a new modular home that’s only 8 feet wide by 16 feet long. 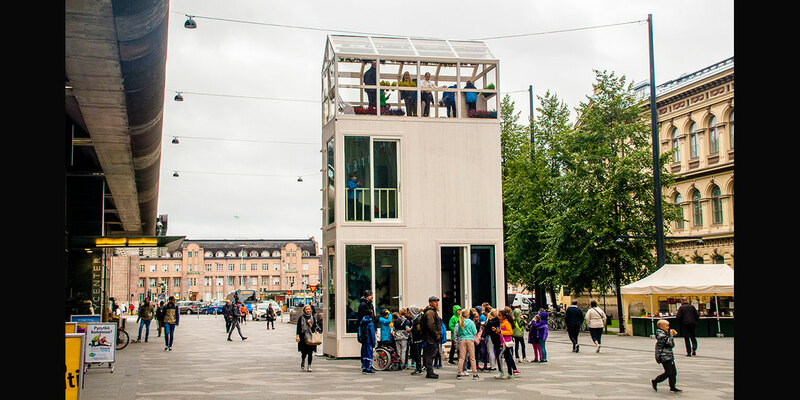 With three stories, the prototype of the design—titled the “Tikku,” or “stick”—features a space for living, a space for working, and at the top a greenhouse. The main catch? There’s no kitchen or running water. Yet. It’s easy to customize the modules—they stack like Legos, the designer points out—to meet the needs of different residents. One floor could accommodate a sauna or yoga studio, or double up the living space, or make room for a small shop. Or that kitchen. The science is fascinating. The design is possible because it uses cross-laminated timber, a strong type of manufactured wood that is five times lighter than concrete (which would cause the building to sink under its own weight). The modules are earthquake-resistant and can be built at a factory, then assembled in a parking spot overnight, Casagrande says. He came up with the idea to address the housing shortage in his home city, pointing out that there’s no shortage of room for cars, and he’s been playing with the question of how to better utilize that space for people. It’s a delightful idea, at least in the abstract. Casagrande even says the modules could be stacked higher if nestled together for additional support (how much sound isolation that would afford isn’t clear). It’s also not entirely unfamiliar, evoking a 2014 campaign from Slovakian firm Design Develop that aimed to turn billboards into living spaces for the homeless. But Casagrande’s is more market-oriented. For New Yorkers and San Franciscans currently paying exorbitant rents to live in almost literal shoe boxes, a triplex box truck probably sounds like a major upgrade. And if you do go for the greenhouse module, you’re sure to end up with better air quality than where you live now, even if you have to walk sideways to get from your bed to your lounge chair. Then again, there’s no word on whether you can stick the “stick” house on a trailer bed and hitch it to your bicycle so you can ride for higher ground when the sea levels rise so far that there’s saltwater lapping at your front door. Maybe Casagrande can include an inflatable raft in the base of the next iteration, so everyone can float to safety in their little houses, too, when the ice caps melt.